I made a new friend on the way to school. I met Richard DeMocker when he was taking his grandson to school. My children attend the same school, and I saw him on a pretty regular basis when dropping off my own children. One day, we struck up a conversation. As tends to be the case, the subject of our jobs and what we do for a living came up. 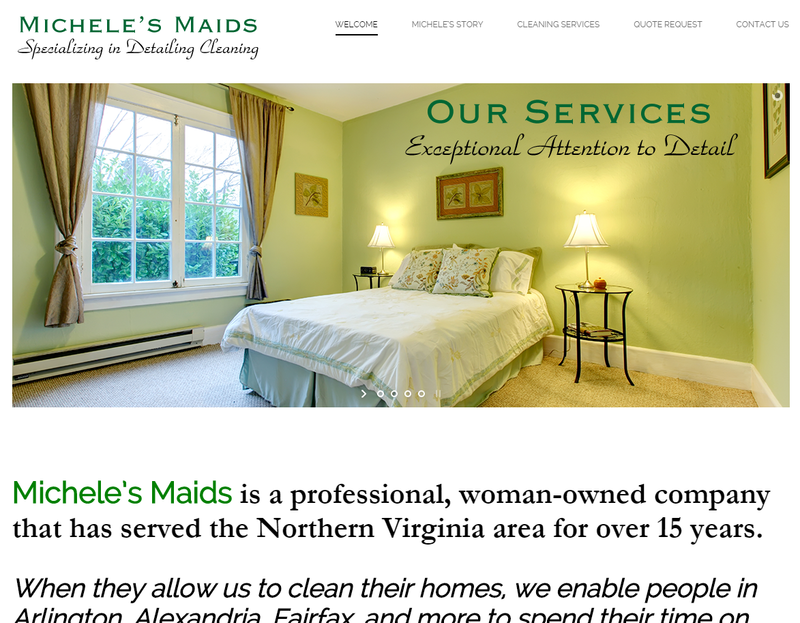 Richard said that he and his wife, Michele, ran a company called Michele’s Maids. Of course, I mentioned what I do, maybe mumbling something incoherent about instructional design, but I didn’t make an immediate connection that I could help Richard and his wife until, on a whim, I checked out his website. The next time I saw Richard, I told him I would love to help him and his wife out. I showed Richard my office and what I could do – as well as some of the things I had done. After some discussion, I created my first draft of the website. Here’s the first draft of their new logo. 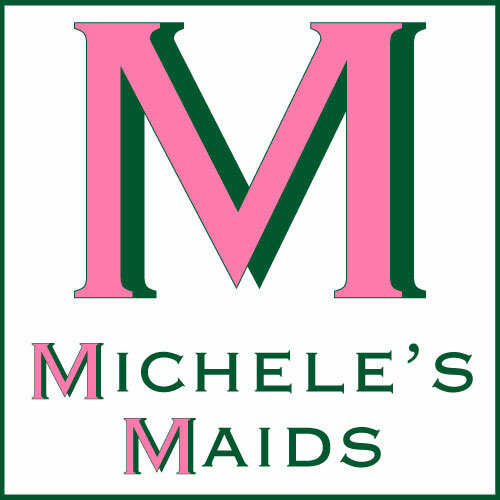 Note the “M” is actually two Ms, one shadowed behind the other – a play on the alliteration in Michele’s Maids. I wanted to make this logo simple and clean while matching the dignified look and colors of their previous design aesthetic. I made all the other graphics used on the site. All of the photo images came from Shutterstock. Once it was ready, Richard, Michele, and I met in my office and they gave me some feedback. They loved the website and the direction I was going in, but, could I make it more feminine? They gave a lot more feedback, as well. Unfortunately, at this time it seemed like I was being pressed on every side, and I could not make the changes without some help. Fortunately, I was able to hire Kouame A. Adi to do just that. Kouame, who asked me to call him Adi, is a student at George Mason University, currently going after his PhD in Learning Technologies. Adi took the framework and many of the graphics I developed into the new website, and he gave Michele and Richard something to look at while it was being developed. Once the site was done, thanks to Adi’s help, we were able to very rapidly make the site live. See our work for yourself. 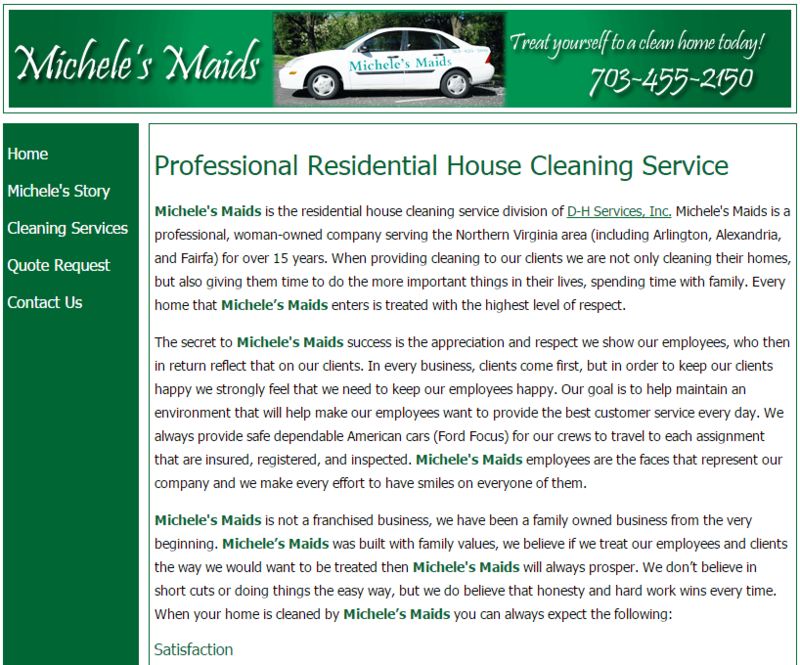 Michele and Richard loved their new website. 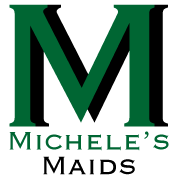 Demand for their services has increased since the new site went live, and there seems to be more urgency to these requests – as if they have already made up their mind that Michele’s Maids is the way to go because of their professional website. Today, we are working together to develop and implement a social media plan that includes blogging, vlogging, training, and graphic design services. You can check out the Facebook page I set up for them, if you like. Of course, if you live in the D.C./Metro area – especially Northern Virginia and D.C., please reach out to them. Their service is as excellent and trustworthy as Michele and Richard themselves. I now consider Richard a good friend of mine and really enjoyed working with him to make their new site – and Michele’s vision for her company – a reality. Here’s their contact information. Seriously, give these guys a call if you need their services.